Bonne Bouche Cheese for sale. Buy online at Zingerman's Mail Order. Gourmet Gifts. Food Gifts. 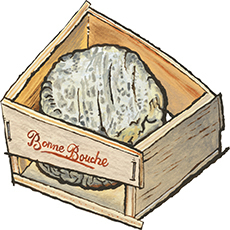 Cheesemongers across the country know Bonne Bouche from Vermont Creamery as one of the best "geo" cheeses around. That's industry speak for geotrichum mold, one of the most used and useful molds in cheesemaking. Geotrichum mold works on a cheese from the outside in. It starts on the rind of the cheese, breaking down the proteins in the hand-ladled curds of this stark white cheese as it goes. First the rind (which is also covered in a thin layer of ash) wrinkles, then the paste starts to break down, becoming creamy, buttery, and luscious as it does. When the cheese is young—about ten days old—it's boxed into a handsome little wooden crate, packaged up and sent to us where we continue to age it in our own climate controled cheese room. Though the little rounds can reach the ripe old age of three months old, we prefer them on the younger side when their flavors tend to be brighter and fresher. Served with slices of apple and a nice baguette, you can turn this cheese into a meal for two (or one, if you don't like to share). It also shines as the center of a fall or winter cheese plate.